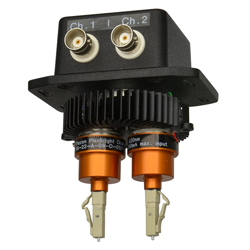 The PlexBright Dual LED Commutator is ideal for experiments in which the only tethered cables are as a result of the optogenetic stimulation. It has a light-weight, low-torque, passive design that supports optogenetic experiments requiring one or two LEDs with animals as small as mice. Further, it is equipped with magnetic LED module attachment bases for faster interchangability - often valuable once the commutator has been fixed in place in a small enclosure.